Woodbury Police Chief Tony Burnett presents Tennessee First Lady Andrea Conte with a proclamation from the Town of Woodbury thanking her for her support of the Cannon County Child Advocacy Friday at Dillon Park. "She is a friend to our children. What we do for the children would not be possible without her support." 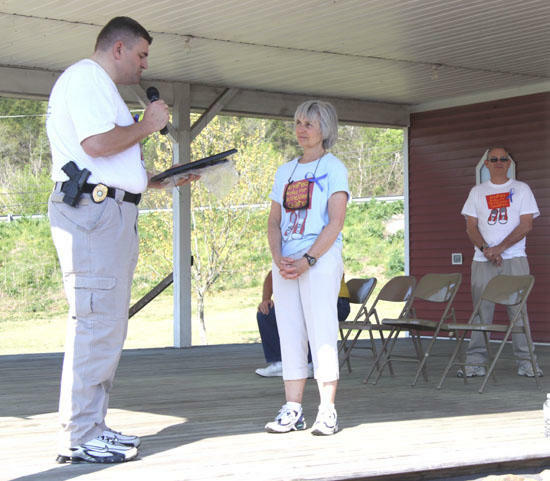 Those were the words of District Attorney Bill Whitesell as he welcomed Tennessee's First Lady to Cannon County Friday morning for the third annual “Andrea Walks for Tennessee’s Children” child abuse awareness walk. Andrea Conte, wife of Tennessee Governor Phil Bredesen, led a one-mile walk that began at Dillon Park and ended at the Fairgrounds Agricultural Center. It was a somewhat bittersweet occasion in that Bredesen is serving in his last year and final term as governor, and she will be unable to continue to walk in them as the First Lady after this year. "My heart will always be with what is going on with the child advocacy centers across the state," Conte said. "They are there to help the children who have suffered abuse through no fault of their own." Conte said she is confident the advocacy centers across the state will find a way to continue the walks should they choose to do so. "The advocacy centers are places that help young victims of sexual abuse and they help prevent crime," Conte said. "We need to help them and we also need to help them recover and lead normal lives." According to Conte, child advocacy centers provide comprehensive support programs for children who are the victims of abuse and their families. “Walking for these children is something we can do both to raise awareness and to support our local Child Advocacy Centers in this critically important work. The support that the Cannon County community provides the Child Advocacy Center is crucial for this organization to help children who are victims of sexual and severe physical abuse,” Conte said. The Cannon County Child Advocacy Center is a non-profit agency that serves child abuse, child sexual abuse, and drug endangered children. The Center staff work as a team with Department of Children’s Services, law enforcement, and the District Attorney’s Office to investigate and prosecute child abuse cases. Last year over, 20,000 children were served at Child Advocacy Centers across Tennessee, including 87 children served by the Cannon County Child Advocacy Center. NOTE: Additional pictures from the Cannon County walk Friday will be posted in our online Photo Gallery this weekend.